TAS Rights ManagementHave you been spending your hard-earned cash this summer on concert tickets? You’re not alone. StubHub is out with its annual list of this summer’s most in-demand tours. 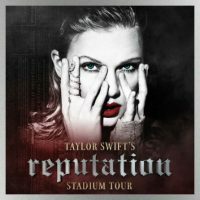 As you might expect, Taylor Swift‘s Reputation stadium tour tops the list. She had the most in-demand summer tour of 2015, too. Of note: Taylor’s average ticket price this time around is 21% lower than tickets for her 1989 tour back then. Taylor is outselling StubHub’s #2 act, The Eagles, by more than 40%, and the number three act by more than 65%. Interestingly, that number three act is Taylor’s former boyfriend, Harry Styles. Sam Smith‘s tour is the most affordable of the 10 most in-demand outings this summer, with average ticket prices at 4% less than the next most affordable act, Kenny Chesney. Of those shows, Sam’s July 4 date in Philadelphia is the most affordable, with an average ticket price of $101 on StubHub.